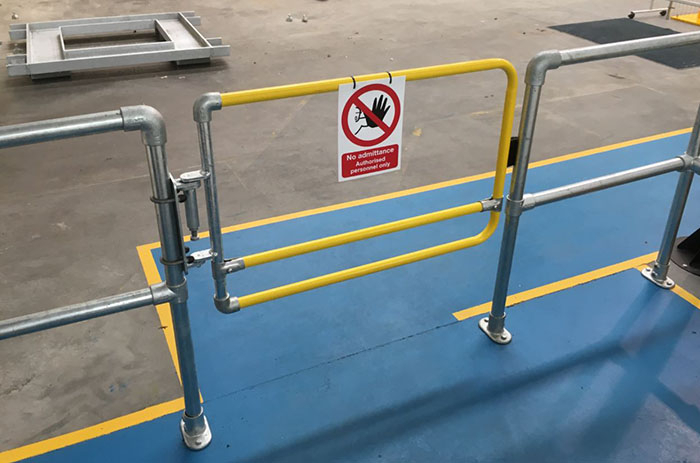 Choosing a suitable industrial safety gate can make the difference between life and death, so do your research when buying one. If your site is already fitted with gates, you need to make sure that these are suitable for the environment they’re in, well maintained and fully working. 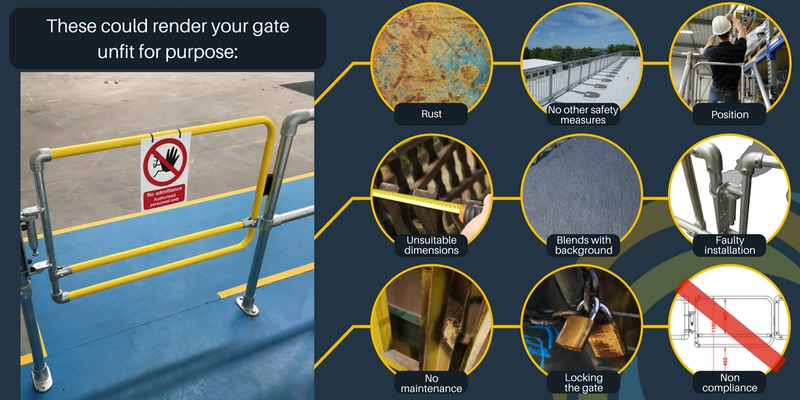 There are several things you need to look at when it comes to safety gates, ranging from the industry you work in, the location of the gate and its purpose. 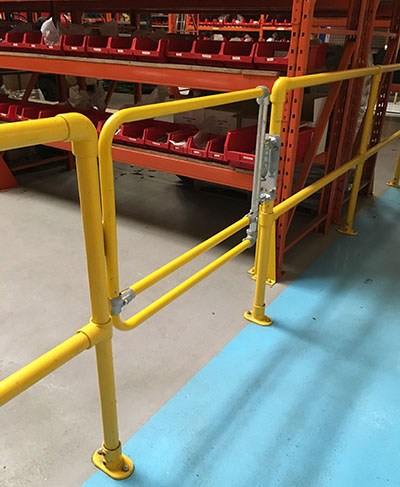 In a warehouse or other general industrial environment, as well as when working at height, self-closing gates are standard choice. This will, of course, depend on the purpose of the gate. Our short guide goes through a few of the things you need to keep in mind when choosing a gate. Where will you install the gate? Requirements can differ depending on the location of the gates. For example, for outdoor use, you need to ensure that the gate is corrosion resistant. Galvanised steel is a perfect material for this scenario, while it’s probably the most economical option as well. Other materials might be suitable for indoor gates for example, as long as they are not exposed to corrosive materials. 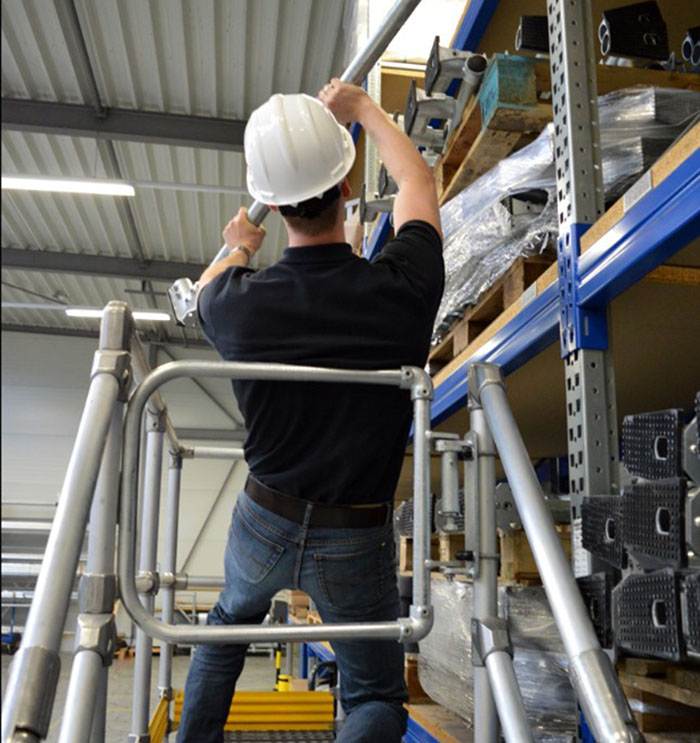 Self-closing gates are a very good solution for working at height, no matter how small the falling distance is. Fix a self-closing gate on working platforms to prevent workers from accidentally losing balance and falling. Make sure to always check the installation instructions carefully, otherwise you may be putting people’s lives in danger. If properly fitted, a gate can stop the fall. Depending on the conditions in your warehouse (humidity for example), select a gate that is made of a suitable material. A combination of handrail and gates can create a clearly delimited safe walking zone. 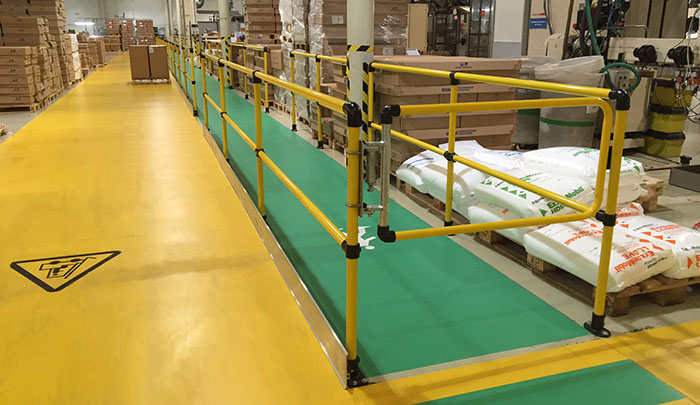 Use this system to safely guide pedestrians through a large warehouse where machinery operates. This will help them stay safe and only walk in special designated areas. 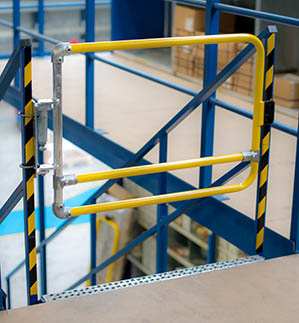 Self-closing gates are often used to give users access to industrial machinery and equipment. Again, a gate can minimise or stop a fall. 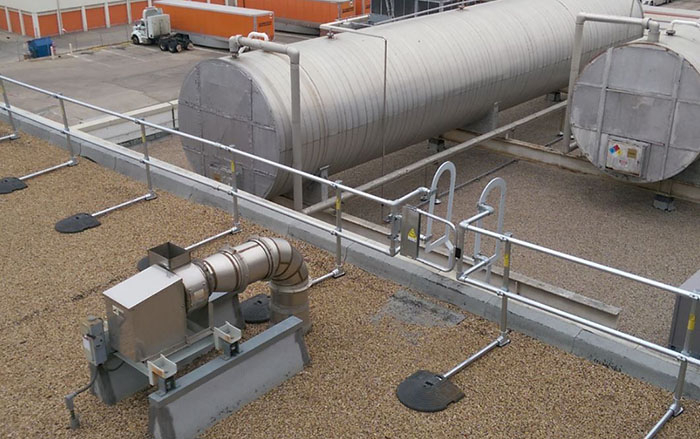 Restricted areas such testing zones or spaces dedicated to industrial machinery can be delimited using a barrier and gate system. Signage should also be used to explain the kind of measures people need to take before entering the area. 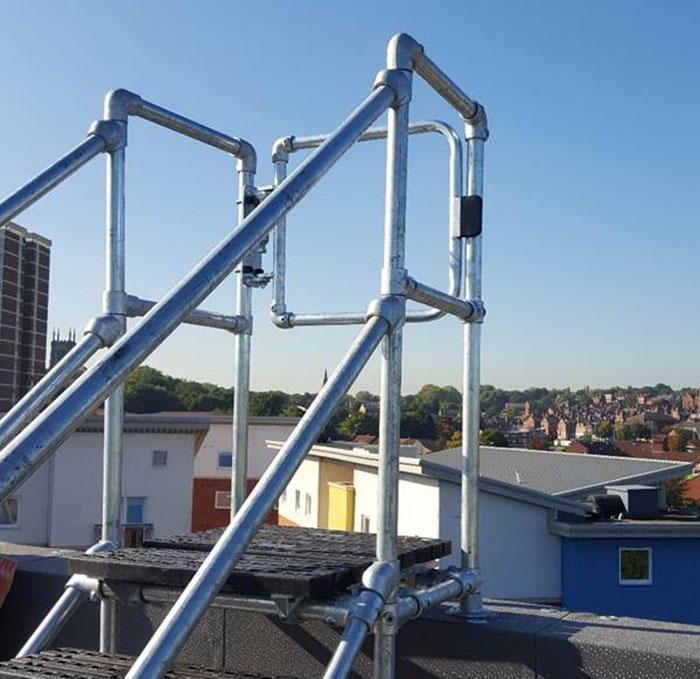 Self-closing gates can be used to provide access to a roof (whereas this is through a ladder or a hatch), or help people navigate to various areas of the roof. 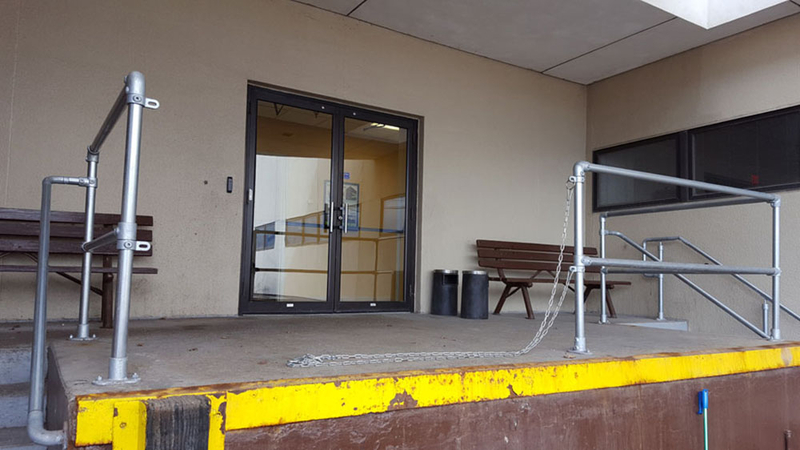 Installed on a step-over platform for example, gates will prevent users from falling when accessing equipment for maintenance purposes. Open voids at the top of ladders can be extremely dangerous. Together with a suitable safety cage, a suitable self-closing gate will considerably reduce the risk of people falling into the void. 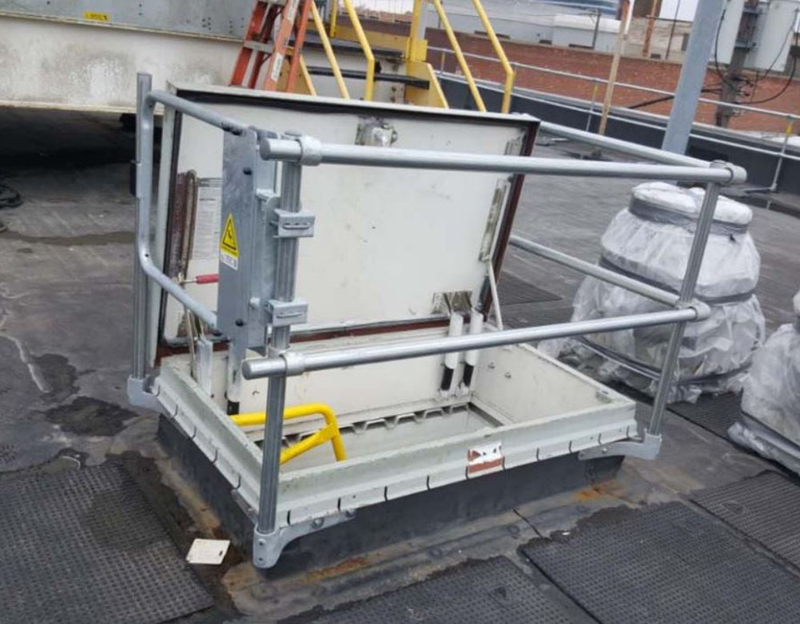 When installed within a close perimeter from the roof hatch (preferably together with a guardrail system), a self-closing gate can prevent people from falling into an open hatch. They won't hold your weight should you trip and fall. They need to be removed and put back by users. If someone forgets to put a chain back after they've used it, then this can affect someone else’s life. Demarcation does not act as a suitable physical safety barrier and it might not actually stop people for entering certain restricted areas. Ribbon tape, stickers and signage in general can be easily damaged or removed. For example, a gate leading the user onto an unprotected area of the roof that is pointless. If you lead users onto the edge of the roof but there is no rail along that edge, then you are sentencing them to death. -> Kee Gate is compatible with all Kee systems, but it can also be fitted onto any other system thanks to its set of fixings. When installing the gate, make sure that the slam plate of the gate will close in direction of hazard. 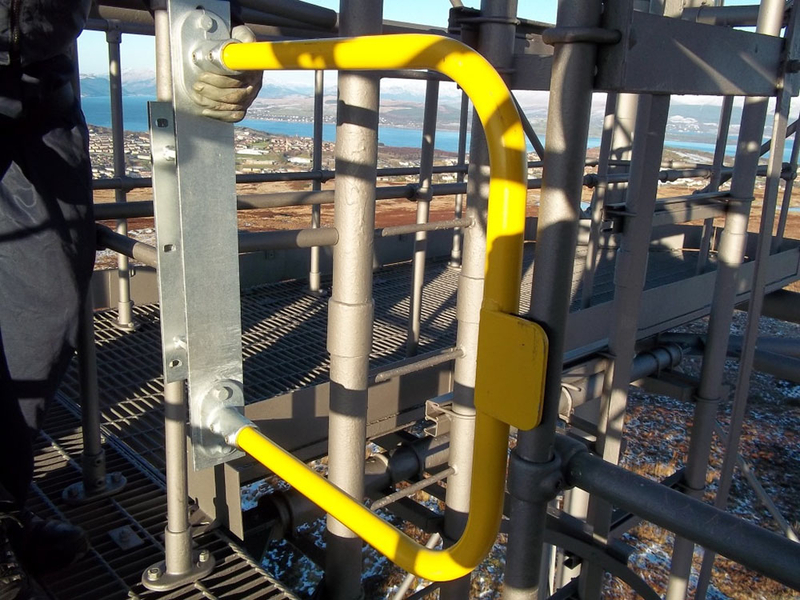 The gate will need to stop a person from falling – when working at height, avoid gates that swing in both directions as these will not stop a potential fall. -> Kee Gate is designed for extra safety and does not swing both ways. If a gate is of the wrong dimensions or is not made of a suitable material, then it will not protect you from hazards. Plastic gates may not be sturdy enough, while other materials might not be corrosion resistant. Depending on your needs, make sure you select the safest option. -> Kee Gate is suitable for most industrial uses and can be installed either outdoors or indoors. 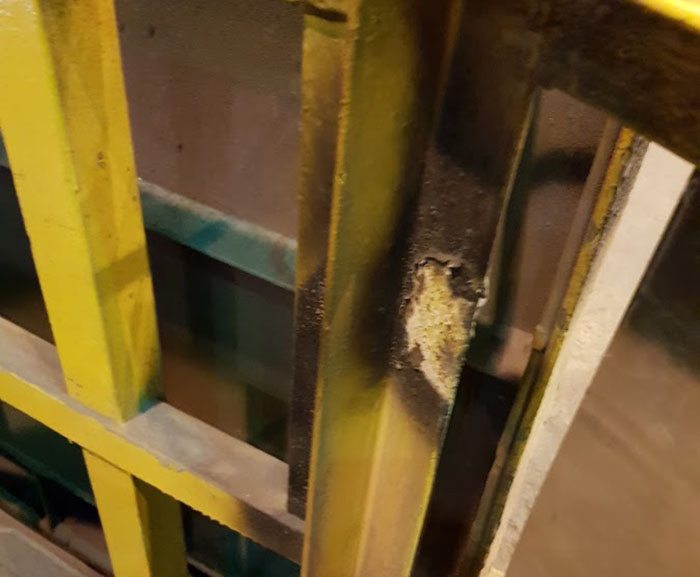 In a lot of cases, especially when working at height, you need to be fully aware of the existence of a gate, especially when this is part of a full barrier solution. Choosing yellow a powder coated gate can solve this problem. -> Kee Gate is also available in safety yellow. Failure to follow the manufacturer's instructions regarding gate installation or using the product in other ways than specified by the manufacturer may mean that the gate becomes unfit for purpose. -> Kee Gate can be installed by anyone and does not require any welding. Just make sure you follow the exact instructions in the brochure provided with the product. You need to make sure that the gate is maintained properly at all times. Rust, missing parts or bad servicing are things you must avoid. 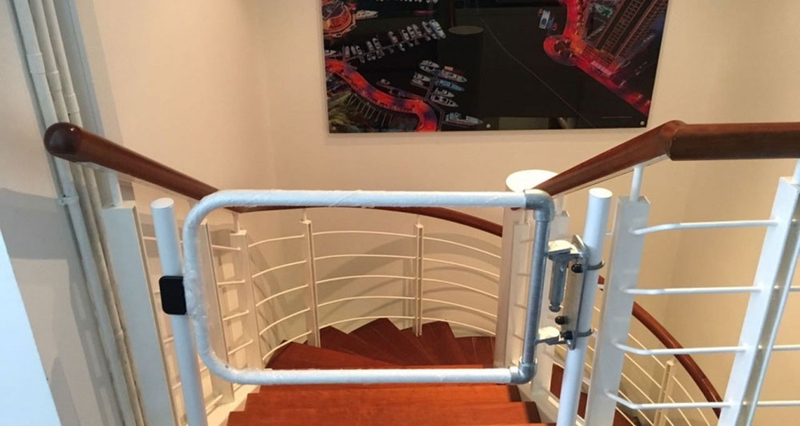 -> Kee Gate is very resistant to corrosion and does not require any welding, but as with any safety products, you will need to keep an eye on any issues that might arise. 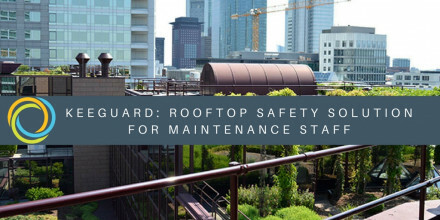 If a self-closing gate is part of a roof edge protection system, then it needs to meet the requirements of the adjacent guardrails. This means that the gate has to be set at a certain height and needs to have a certain width to comply with the regulations. 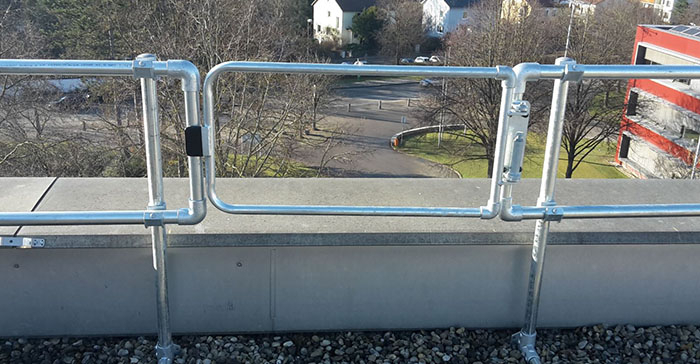 -> Kee Gate is compatible with our roof edge protection guardrail, which is also compliant with the industry standards. Different industries have different requirements. Some of these requirements will dictate what material your gate should be, what shape or size, as well as where it needs to be installed. Become familiar with these regulations before buying a gate. -> KeeGate complies with the following standards: BS EN ISO 14122-3:2016. Locking a gate, especially when situated on a roof ladder for example, will be dangerous for anyone not being aware that the system is locked. They will try to open it several times, probably pushing and pulling it, which might cause them to lose balance and fall. The same scenario applies to gates that do not open easily, for example the ones that get stuck due to residue or rust. 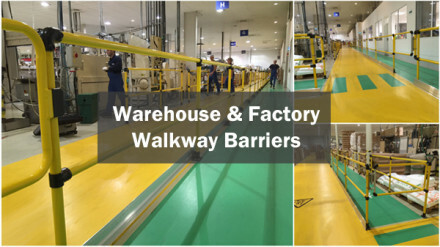 Learn more about our warehouse and factory walkway barrier solutions. Providing the best solution for our customers is paramount. 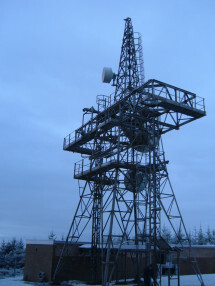 When it's a customer like the biggest telecommunications company in the UK with hundreds of sites, you need to consider a multitude of options, or better yet, a 'one size fits all' solution.